WHY GO: If you’ve got the funds for – or curiosity about – high end fashion designers, and don’t fancy a trip to France or Italy (especially with planes these days), you’ll be exceedingly satisfied with the shops, restaurants, and hotels that make up the Madison Avenue Business Improvement District. Spanning Madison Avenue from 57th to 86th St., the Mad Ave. BID is one of 76 such Districts within the five boroughs. Created in 1996, BID, a quasi-government Not For Profit agency is the mechanism through which businesses collect funds for street cleaning, store security, holiday decorations and more. But how does this relate to tourism? And how did the avenue most associated with advertising (Madison Ave. Men/aka Mad Men) become such a Mecca for fashion? I was curious, too, so I spent the good part of a day walking 1-½ miles on the street that most tourists miss in lieu of 5th Ave. – a thoroughfare more associated with upscale establishments. What I found really surprised me. This reach of Madison Ave., north of the commercial office buildings that house those noted advertising agencies, has always been an exclusive residential area of Manhattan. Wealthy women who could afford couture would fly to Europe to purchase the latest fashions. But in the late 70’s, early 80’s, designers began to open their own boutiques outside of Paris – on the Upper East Side’s Madison Ave – to be steps away from their clientele. First Yves St. Laurent established his store on the corner of 71st St (where E. Pucci is now), and then, in the early 80’s, Ralph Lauren opened his flagship in the former Rhinelander Mansion on 72nd. More and more designers moved in. 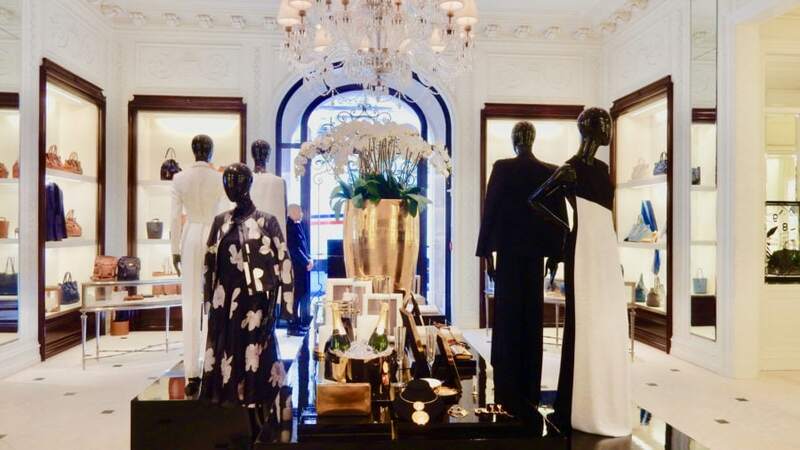 Now, not only do top designers work on Madison Ave., some can be found in their shops (and at least one, Giorgio Armani, plans to build condos and move here). Peek through any glass shop door, generally manned by a doorman, and you might see a few locals pouring over diamond rings or being shown a dress that has just arrived. Walk this area of Madison and you’ll be privy to intimate glimpses of neighborhood life that you won’t see in the larger designer establishments on 5th Ave. And, as a bonus, stores are much less crowded and considerably more hushed. START: from Central Park South and these Getaway Mavens recommendations for a romantic start, and then make your way east to Madison Ave at 57th. The first several blocks of the BID leans commercial, with work spaces above stores the likes of Fendi, Coach, Lalique, Mont Blanc, Stuart Weitzman, Marc Jacobs and Calvin Klein. Ralph Lauren actually comes to work in an office building across from Baccarat and next to Celine near 58th. STOP into the tiny Sermoneta Gloves, opened here 16 years ago, where you just might find the 6th generation of this family-owned Italian leather goods company, Aldo Sermoneta, helping customers. “Our Jewish family started out making gloves for the Pope in 1960,” says Aldo. “The headquarters in Rome is an Italian landmark.” Handcrafted leather and cashmere Sermoneta gloves, in contemporary vivid shades, have graced the hands of celebrities, royalty, and quite possibly, you. Walking north – the buildings start to get more residential. Here, you’ll find the Tom Ford flagship, Berluti, Bally Flagship, the future digs of Missoni (now on 77th) and more men’s fashion shops. STOP: Barney’s, credited with launching the careers of many clothing designers including Giorgio Armani, moved to 61st from downtown in the ‘90’s (and recently re-opened its downtown store again). Book a table at Fred’s – Barney’s hot restaurant, or just come in to see new collections on each large light-flooded floor featuring the latest designers. Around 62nd St., there are two Hermes across from each other: Men’s and Women’s. Step into Women’s store, if only to ogle the hand stitched tan leather on the circular staircase rails. Heading up, there’s Georg Jensen, Hublot Watches, Chopard, Jimmy Choo’s flagship, before getting to the bejewled block around 63rd where you’ll find Graff (diamonds), David Yurman, and the Brit-based De Beers. STOP in De Beers, known as “The Home of Diamonds Since 1888.” It’s blingy and expensive, but shopkeepers are friendly, even if you don’t intend to spend millions on a rock (or even a couple of hundred grand). Bottega Veneta Masion (64th) restored three landmarked buildings and opened to much fanfare in 2018. Stop in for a look at the triangular-shaped spiral staircase – a cool architectural element. Heading up, find Chanel Accessories and Shoes, Alexander McQueen, and Givenchy. Take a right on 65th, walk down the block and you’ll find #47 and #49 65th, the former NYC homes of both Franklin and Eleanor Roosevelt, and FDR’s notably overbearing mother, Sarah, now owned by Hunter College. Built as a wedding gift, the two residences share an entrance with two separate doors, though the homes were joined on the top floor. So much for privacy, and no surprise that Eleanor was not happy here. However, this is where FDR heard that he had been elected President, and aside from a small museum, this historic site is important to those who research Roosevelt’s life. The corner of 65th and Madison will soon be demolished and rebuilt with luxury condos (2020-2023), care of Giorgio Armani, who plans to move into one of them. According to press releases, Armani will build a 96,000 sq ft. structure that will incorporate 19 Armani Casa residences, and a 2-story Armani Flagship. Walking uptown, gaze at (or enter) Oscar de la Renta on 66th. When he was still alive, de la Renta would play the piano there during Fashion Night Out – drawing clients like Barbara Walters and Sara Jessica Parker to croon around the keys. Speaking of being drawn, I was so enticed into Edie Parker – maker of whimsical gem-colored acrylic handbags and accessories that go for $1300 and up (domino sets, $2295). This is Edie Parker’s only store anywhere, and all products are made in the USA. Back up to 67th, you’ll pass J. Mendel Furrier, Michael Kors Collection Store, and a slew of art galleries. Continuing north to 68th, find Kate Spade, Tory Birch, Frette Flagship, and Max Mara. Watch tailors at work on the second floor catwalk at Isaia, a small Italian men’s shop where you can order a custom suit in the softest of wools. Onwards and upwards, past Valentino (which also is on 5th), Dolce & Gabbana, Akris, Anne Fontaine, Prada, the old Westbury Hotel (now condos), Elie Saab (the only store in the USA), Lanvin, Emilio Pucci, and the must see Ralph Lauren Flagships across from each other at 71st. STOP: The two stores could not be more different, with equally swanky interiors worth perusing. Lauren just held his Spring Fashion Show in the brightly lit, white marble chambers of his Women’s Home and Jewelry establishment, which also houses the brand new Ralph’s Coffee – a sophisticated place to refuel. STOP: Across the street, also on 71st is the former Rhinelander Mansion, now Ralph Lauren’s Men Store – darkly paneled and crammed with cigars, dog and horse art, watches and the like. Neither establishment is meant for big crowds. STOP: If you’re hankering for a spot of tea and a macaron right about now, the place to go is Laduree between 70th and 71st. It’s a jewel box of a shop, straight out of Paris, with mint-green walls and cookies in every conceivable pastel color. Boxed chocolates cost a pretty penny (12 pieces $35, 40 for $100), but they are a popular hostess gift around here. STOP: You’ll find the jeweler, Paul Morelli, on the corner of 72nd St. If that name rings a bell, it’s because readers of the print NY Times see its add every day on page two. Known for its delicate necklaces and bracelets in gold and diamonds, Morelli also designs wearable art pieces in colorful precious gemstones. Shopkeepers are warm and friendly, and even if you’re just looking and polite, they apparently enjoy the company. Stroll a couple of blocks past (or into) Stella McCartney before popping into an Apple Store like no other, on 74th. This one, in a former grand bank building (go downstairs to see the vault), glows with backlit art on every wall. It’s a very cool space – and surprisingly not overcrowded.A few paces away, you’ll find a few stores with a more funky downtown vibe: Golden Goose Delux Brand, and the only US outpost of one of Elton John’s favorite brands, Joe Bananas. GO: Met Breuer @ 75th. Just a heads up – in 2020, the Met Breuer, formerly the Whitney Museum (and still owned by it) will shut down in order to accommodate the contents of the Frick Collection, which will be going through its own renovation for several years. The solid box of a building – as weighty and clunky as the Guggenheim is curvaceous and bright – will still be the place to go. Until then, check out rotating exhibits that compliment the big moma Metropolitan Museum of Art several blocks away. North of the MB, is Carolina Herrera, the famous red-soled Christian Louboutin Flagship, and something you don’t see much anymore – an independent department store. STOP: The family-owned three story Zitomer is a throwback to the 50’s, and a true upper East Side landmark that sells everything from cosmetics and pharmacy items to clothing. It’s worth it to stop in and see where locals shop and what they wish to preserve. STOP: Another good resting spot is the ever popular and very European Sant Ambroeus for sweets, espresso, gelato, or the Christmas gift favorite, their Panettone Cake. You can also pick up a Baguette Sandwich, which puts one in mind of an Italian sidewalk café. Or STOP: La Masion du Chocolate. From first glance, it seems like strictly a chocolate shop, but there’s a back room with table service, and some say the best hot chocolate in the City. STOP: Just off 79th, art galleries in former mansions beckon. Don’t be shy, and don’t assume you can’t enter. Acquavella is more like a museum than an art store, so by all means, check it out. LOOK: Look down, and pay attention to the wavy black and white sidewalk art installation, emblazoned with “AC 70”. Alexander Calder’s paint studio was right here – and he designed the path just outside his door in 1970. STOP: Around 80th St. step into a shop that is so specific, so esoteric, as to actually encourage questions of the owner, Nicholas Brawer. Brawer is a collector/restorer of rare giant binoculars used by Navies around the world during WWII, some that were captured from the Japanese. An unconventional hobby has turned into a career, to be sure, but the functional and burnished results of Brawer’s restorations are nothing short of magnificent works of art. Congratulations. You’re within sight of the terminus of the Madison Ave. BID, around work-out-apparel row – 85th St, where you’ll find Peleton, Lulu Lemon, Sweaty Betty, and Theory. Just in time for “elevated Italian” at Restaurante Morini on the corner of 86th. Or, if you have time, make sure to walk a few blocks to the Metropolitan Museum of Art one avenue over on 5th and 82nd. For those who’d like to combine a bit of Harry Potter with their (window) shopping, sign up for the following two hour tour. DO: Fable & Lark Wizard, Goblins, tour of the Metropolitan Museum of Art at 82nd. and 5th. For an intimate behind the scenes treat, book one of Fable & Lark’s Storied Adventures – programs that let iconic stories (i.e., Harry Potter, Fantastic Beasts, Game of Thrones) be the template by which to explore iconic NYC Museums. After a stint at Scholastic Books and 18 years in Educational programming at the Metropolitan Museum, Fable & Lark owner, Evan Levy, struck out on her own to offer meaningful museum tours for both native New Yorkers and visitors. “All of my tours are very interactive,” says Levy. Her latest, developed on the 20th anniversary of the first Harry Potter book in 2016, is an “activities-based” trip through the Metropolitan Museum of Art (82nd and 5th). With a great deal of knowledge and deep dive into Potter-speak, Levy peppers her groups with questions, and, IPad in hand, shows and tells participants at each relic and room how it is suggestive of J.K. Rowling’s books and the movies based on them. You meet in the Metropolitan Museum’s Great Hall (beneath the Pharaoh statue), a carbon copy of the Great Halls of Europe (e.g. Christ Church College) upon which the Hogwart’s Dining Hall was modeled (the book’s Hogwarts is actually set in Scotland). One Roman Statesman’s marble bust, with busted nose, looks eerily like Lord Voldemort. “In the book, Rowling writes that Voldemort was ‘so pale he seemed to emit a pearly white glow.’ Much like marble, I think,” concludes Levy. At various points in the tour, you’ll be tasked with brain-engaging challenges (which I won’t spoil alert here), scavenger hunts, and given goodies to take home. By the end of the 2 hour tour, you’ll have walked the complete quarter mile long Met Museum. $47.50pp, Wed/Thurs/Sun at 11am, Sat at 11am and 1:30, rsvp required, private tours by request. STAY: Plaza Athnee on 64th. Hotel employees know repeat guests by name at this very old world, luxury of another era lodging establishment. STAY: The Carlyle on 76th. Home of the famous Bemelmans Bar (featuring murals painted by the artist famous for his children’s book, Madeline), and star-studded Café Carlyle, the Carlyle Hotel is as old school traditional as it gets. And proud of it. STAY: The Surrey Hotel on 76th. Renovated to chic modern aesthetics, the grey and white mosaic lobby floor is stunning, as is the similarly hued Chuck Close painting hanging near the elevators. Rooms are done up in 1920’s glamour – so it’s no wonder that this is one of the top hotels in Manhattan (which is saying quite a lot). STAY: The Mark. The most trend-forward of the lot, The Mark purportedly has the most expensive hotel rooms, and is particularly hot during the Met Ball (the Metropolitan Museum of Art is 5 blocks away).